We’re all newcomers as people of faith – always working to experience God in new ways. No matter where you’ve been and wherever you’re headed, we welcome you here. Messiah is a place to hear God’s stories and to tell our own in an open, loving place. We celebrate innovation and diversity and are grounded in ritual and tradition at the same time. We welcome your questions, your challenges, and even your crises of faith. We know we will be better for knowing you. Many of our members are new to Messiah – a quarter of the congregation joined us less than five years ago and half of us come from other faith traditions. We believe in justice, service and striving to be God’s living presence on earth. We believe in gathering in worship, singing together and working together to make our Village and Town and World a better place. 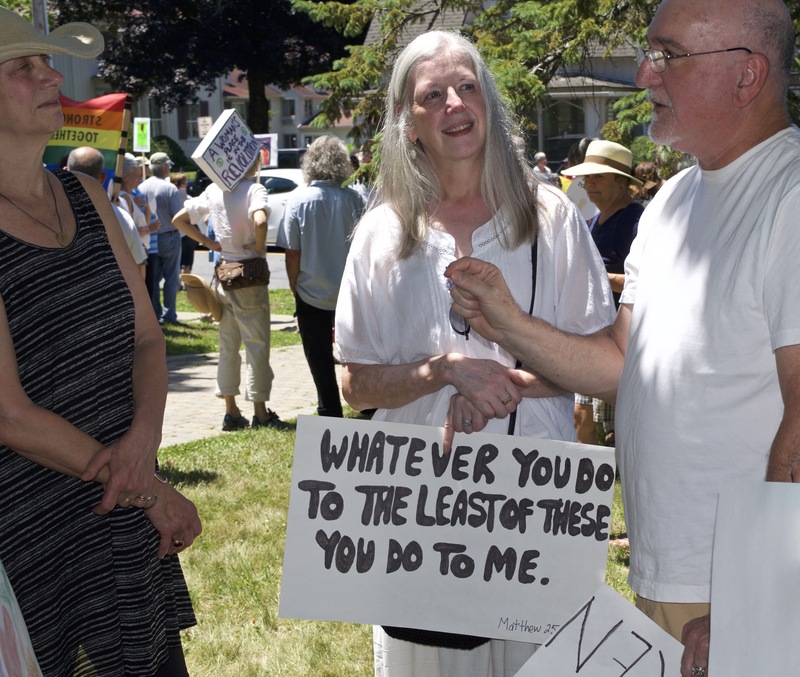 Community rallies at Messiah’s June 30th, 2018 Interfaith Service and Witness in support of Justice For All: Keeping Families Together. We truly come as we are . . . and that applies to our wardrobes as well. Some wear Sunday best and some of us luxuriate in our most comfy jeans. Whatever you wear and whatever your struggles, we look forward to meeting you. There’s no preparation required. Our printed Order of Worship contains everything you need to know to fully participate in the Service. As with many faith traditions, we sing together, listen to readings and a sermon and share the Holy Eucharist – which is also known as Communion. As is the case with everyone who attends, you are welcome to participate in any way you feel comfortable. Children of all ages are welcome in the Service. Most families prefer our 10am service where our young people who are enrolled in Church School (pre-K through 5th grade) attend class for the first part of the Service and join us just after the Sermon. All children are welcome for the entire service . . . even when they cry, gurgle, yell or disagree with the Sermon. There is a parking lot adjacent to the Church which is accessible from either Chestnut Street or Route 9. Many of us park on Chestnut Street as well. The handicapped entrance is accessible from the parking lot (where there are designated handicapped parking spaces). The ramp is on the southwest corner of the Church. Will I know what to do next in the service? Everything you need to participate is in the Order of Worship which is distributed by the ushers when you enter the Church. Can I receive Communion and how does that work? Communion for us is an expression of a deep relationship with God and one another that we nurture and encourage at Messiah. So, all are welcome to receive Communion and we hope that you do so. Our Sunday 10 am service includes music from our Adult and Children Choirs, hymns we sing as a Congregation and beautiful organ music. You are welcome to have your children with you in Church for the entire service which most people do who are visiting us for the first time. If your child is at least 4, they are welcome to join our Church School, where they meet each Sunday at 9:45 am. They join us in Church after the Sermon. The first Sunday of the month is a family service in which children are present in the church for the entire Service. We offer a broad range of opportunities for service to the community. From the Food Pantry, to the prison ministry, to the Third Thursday Luncheon program, the Messiah Community is busy and engaged. Click here to view a full list of our Programs.